A Dora the Explorer and Mr. 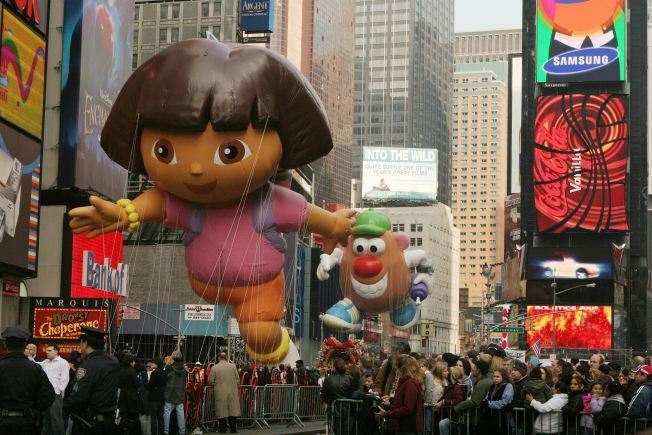 Potato Head balloons float through Times Square during a Macy's Thanksgiving Day Parade. The big Macy's balloons heralding the start of the Christmas season may have already made their last pass through Times Square, according to Crain's, which is reporting that the Department of Transportation has formed a working group to consider moving the parade. The 83rd Macy’s Thanksgiving Day Parade, scheduled for November 26, 2009, could be diverted to Sixth Avenue, according to the business paper. The move is under consideration for a number of reasons, including the plan to make Times Square more pedestrian friendly and the narrowness of Broadway. Normally the parade starts on Central Park West near the American Museum of Natural History and then travels south to Columbus Circle. From there, it turns onto Broadway, traveling south until it reaches Herald Square, where it turns west onto 34th Street. The official end of the route is at 7th Avenue.